“Those who look for the laws of Nature as a support for their new works collaborate with the creator.” – Antoni Gaudi. This is possibly the quote that best represents Gaudi’s work and philosophy, and undoubtedly the one that makes me his newest fan. My decision to go to Barcelona was influenced since the beginning by my curiosity towards Gaudí’s outlandish architectural style but, as a big fan of anything that has to do with Nature, finding out that he loved reproducing the shape of natural elements in his work made the trip even more intriguing. I took a tour devoted to local architecture and the environment where Gaudí worked and his genius was shaped with Context Travel. At 9.30 am I met art historian Biel Heredero Serra at the number 132 of picturesque Passeig de Gracia, in the city centre, near La Rambla and the beautiful La Boqueria market, where our journey through Barcelona’s controversial past and fascinating art started, Casa Fuster. 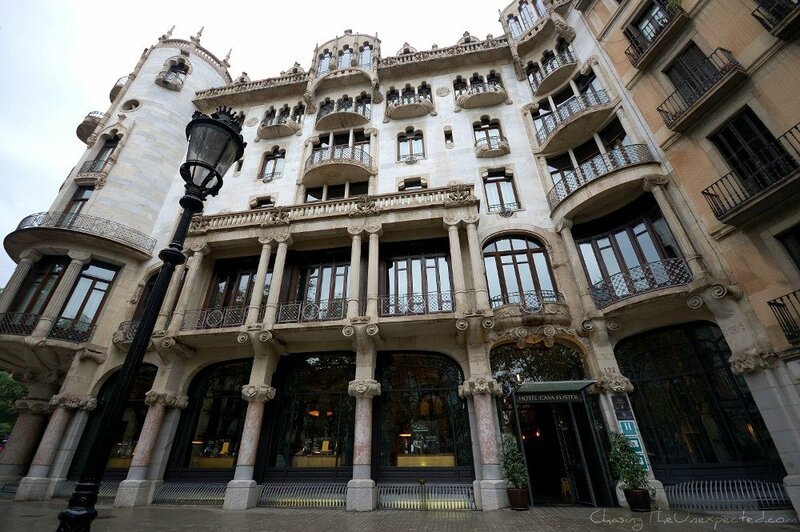 Now a five-star hotel, Casa Fuster had been originally commissioned by the Fuster family to architect Luis Domenech Montaner, one of the greatest exponents of the “Modernisma” movement, as Catalans like to keep it, in its original language. The first element you will notice if you happen in front of this now luxurious hotel is its eclecticism, where gothic elements will sit side by side with Roman-looking columns and baroque-style details. Take Walks organise a great Gaudi tour in Barcelona where you will visit Casa Batlló, Park Guell and an extended visit to the Sagrada Familia comprehensive of tower climbing and museum entrance. You will also see Casa Milà from outside. –>> If you can spend some more time in the region and want to take a day trip from Barcelona, Montserrat offers a fascinating culture and a breathtaking landscape. Among the other places to visit in Spain, we suggest you don’t miss the gorgeous Andalusia region in cities like Cordoba, Granada, Seville and Cadiz. Also, if you want to know what to do in one day in Madrid, click here. Before moving on to the next masterpiece, Biel made a step back in the past and told me that where we were standing that moment was actually a neighboring town, only later incorporated to Barcelona territory during the urban planning of the end of the 19th century, when the now famous “Eixample” (Enlargement) was added to the beautiful Barrio Gotico (Gothic Quarter), the only initial district of the old city. Our journey went on through the greatest masterpieces of Barcelona architecture that, like it or not, is unique the world over. The tour introduces the most important figures that have contributed to making Barcelona so beautiful and one of a kind, and tourists can consciously wander the streets of the city and enjoy names of the likes of Josep Puig i Cadafalch and his beautiful creation Casa Amatller, commissioned by chocolatier Amatller, just beside Gaudí’s surreal Casa Batlló, architect Antoni Rovira i Rabassa and the already mentioned Salvador Valeri i Pupurull and Luis Domenech Montaner. 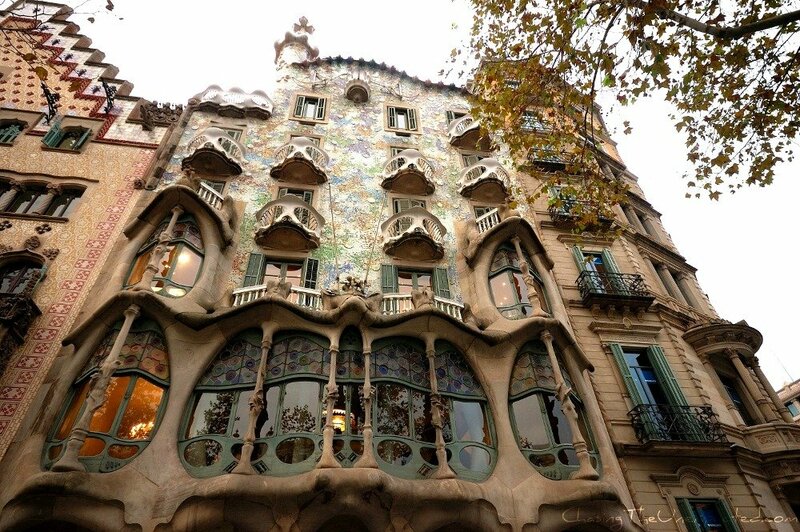 Before admiring the colours and the shapes of the front façade of Casa Batlló, our Gaudi architecture tour took us to explore Gaudi’s masterpiece, Casa Milà or, how locals like to name it, La Pedrera, at the number 92 of Passeig de Gràcia. I can’t stress enough the importance of visiting La Pedrera for anyone who heads to Barcelona and wants to learn more about Gaudi. Casa Milà is a house commissioned by entrepreneur Pere Milà and entirely designed by Gaudi, both the interiors and the exteriors. And you can easily see that as soon as you walk through the door. At the beginning of the 20th century, the district of the Eixample, that includes also Passeig de Gràcia, was considered the centre of Barcelona’s expansion, and this is where many of the best examples of “Modernisma“-style architecture were built. 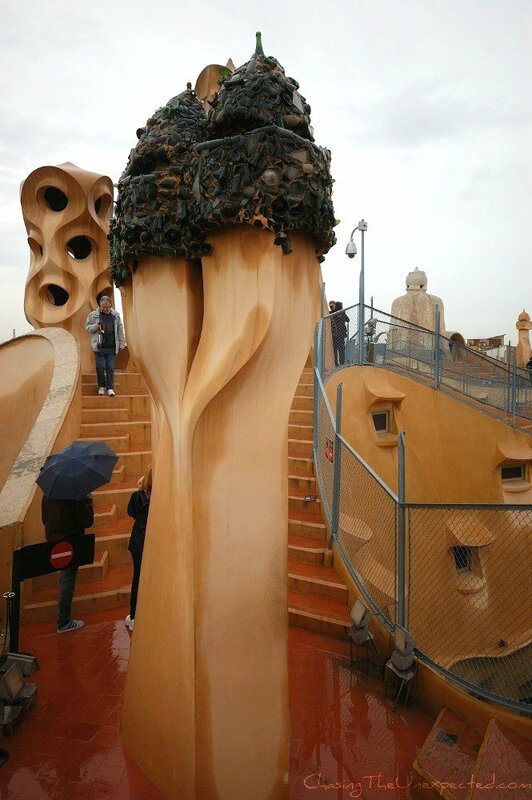 On the ground floor of La Pedrera, where Caixa Catalunya, that bought it in 1986, set up a museum to explain Gaudi’s genius, I found out that the artist used to find inspiration in Mother Nature elements: human body, trees, shells and anything easily available on planet earth. In fact, don’t the columns of Casa Battlò look like human bones? And don’t the balconies of the same building look like skulls? As far as I’m concerned, Gaudi’s nature-connection is enough for making me like him. After feeling outraged that it became a case only because the victim was Gaudi, I felt very saddened by his early and unnecessary death, and for all the unnecessary deaths that used to happen, and unfortunately still happen, this way. 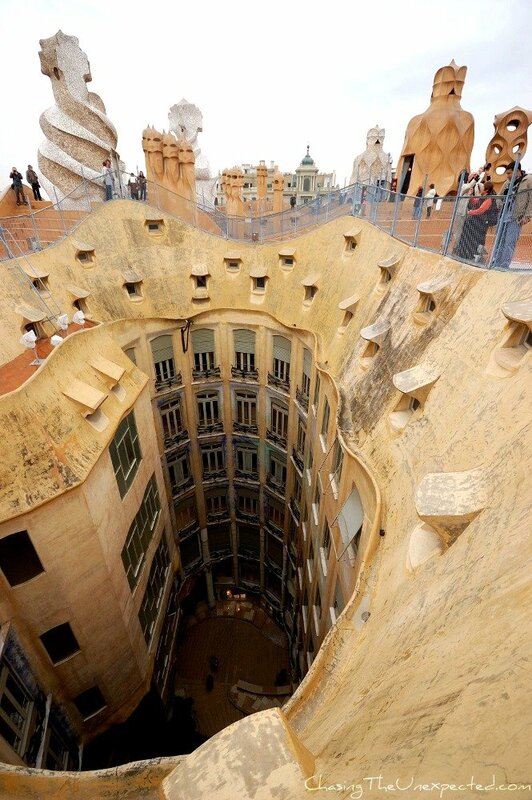 The fact that, after La Pedrera was completed, the owner complained because he couldn’t find furniture to adapt to irregular and asymmetrical walls, today only adds charm to the genius. 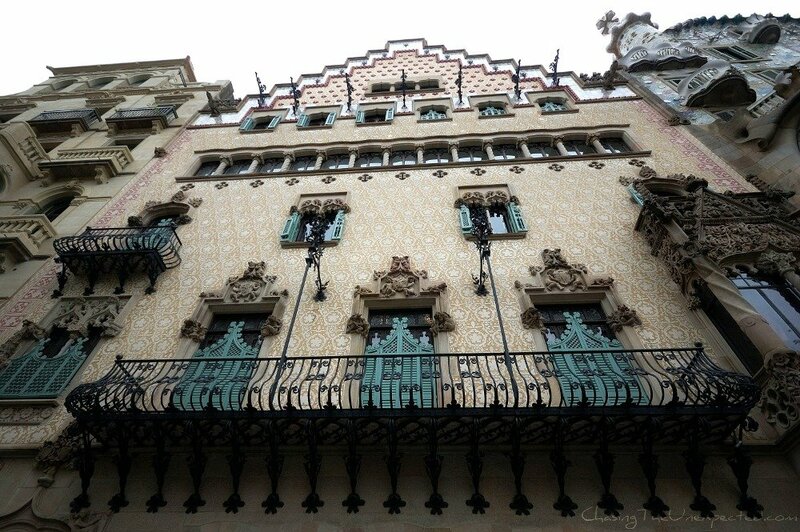 The tour ended further down in Passeig de Gràcia, admiring the colours of the wonderful Casa Batllò that sits beside Josep Puig i Cadafalch‘s masterpiece Casa Ametller and Luis Domenech Montaner‘s creation Casa Lleó Morera. From the beautiful roof of La Pedrera it’s possible to catch a fleeting glimpse of La Sagrada Familia, the church that is considered Gaudi’s absolute masterpiece, although he didn’t even see it completed. After having admired some of the precious works of Barcelona’s most famous architect, it just wouldn’t have sounded right to leave the city without seeing La Sagrada Familia. I stayed in Barcelona for only one day, so I didn’t have enough time to visit the church inside, also because when I arrived the queue was still too long. But I’m glad I did go, I managed to take pictures of the church all around, a truly breathtaking masterpiece that is now a great reason for me to go back to Barcelona. Address of Casa Milà: Passeig de Gràcia 92. Opening hours of Casa Milà: From Monday to Sunday, Mar. – Nov. from 9 am to 8.30 pm, Nov. to Mar. until 6.30 pm (last admission half an hour before closing time), and for the night visit 9-11 pm. Closed on December 25th. Opening hours change with the season, to know the time before your visit check the website https://www.lapedrera.com/en/visitor-information. Entrance fee for Casa Milà: Adults € 22, students, disable and over 65 € 16.50, free for children under 6, € 11 for children from 7 to 11. Barcelona is included in the Eurail Passes so if you are travelling around Spain and Europe it’s very easy and convenient to do so by train. 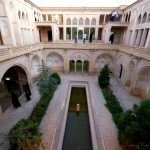 As a design and visual person I found these architecture fascinating. Great share! I think you would absolutely love Gaudi, it’s really unique. Mon Dieu, c’est un reve , c’est au delà de toute imagination! Le génie humain n’a pas de limite! 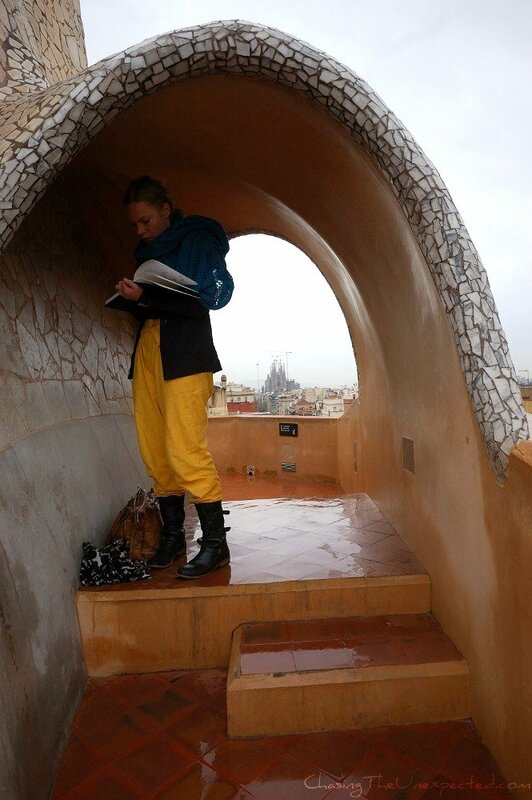 These are the most up close and captivating photos I’ve seen of Gaudi’s work, Angela. I also had no idea about his Nature philosophy. 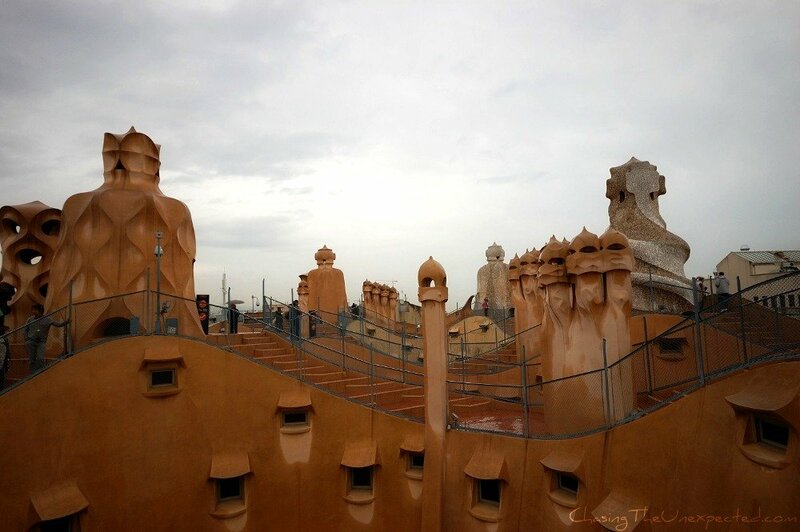 I must see La Pedrera and walk on that roof someday! It’s so nice, when I went it was raining and they usually close it to the public when it rains but thankfully we were allowed on the roof. Of course it’s much better when it’s sunny, I might go back, after seeing my pictures my mom is very curious too. Well, I am in love with Gaudi. What would our world be without these imaginative, brilliant creators! You are absolutely right, the world would need more brave artists like Gaudi. Barcelona looks beautiful, I’d love to visit sometime! It’s a very beautiful city, and very much walkable, so a pleasure to visit without too much hassle. Barcelona — my obsession!! I love it there. It really captures the creativity and magic I believe in in life! Yeah, so diverse and lively. Coming soon a post on La Boqueria market, wonderful! It’s actually what led Gaudi to start designing his own furniture! 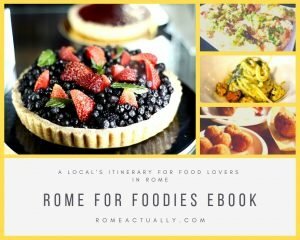 I’m really loving that you’re in my favorite city in all of Europe! Personally, I like Casa Batllò the best. I think it is the best example of Gaudi’s genius(arguably so). I think it especially since it has a different look up close as it does from afar. I should go on a Gaudi tour next time I’m there, seems interesting. I was so moved by La Sagrada Familia. 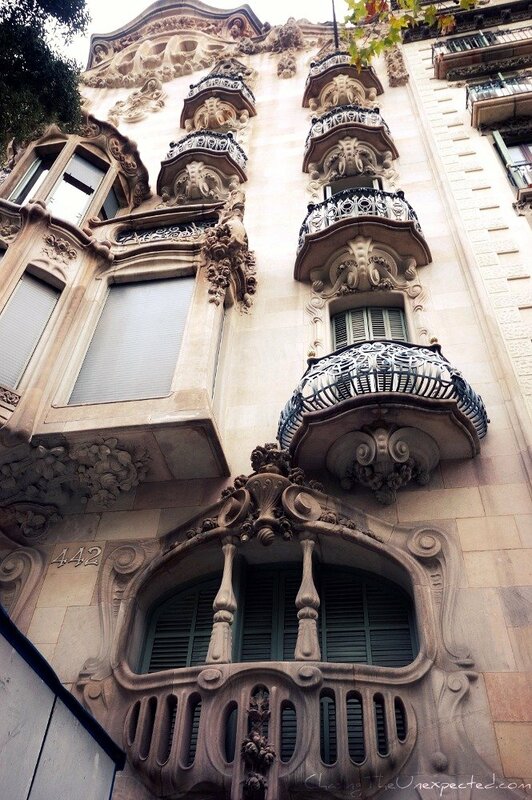 I hope to visit Barcelona again soon and check out more of this incredible architecture. 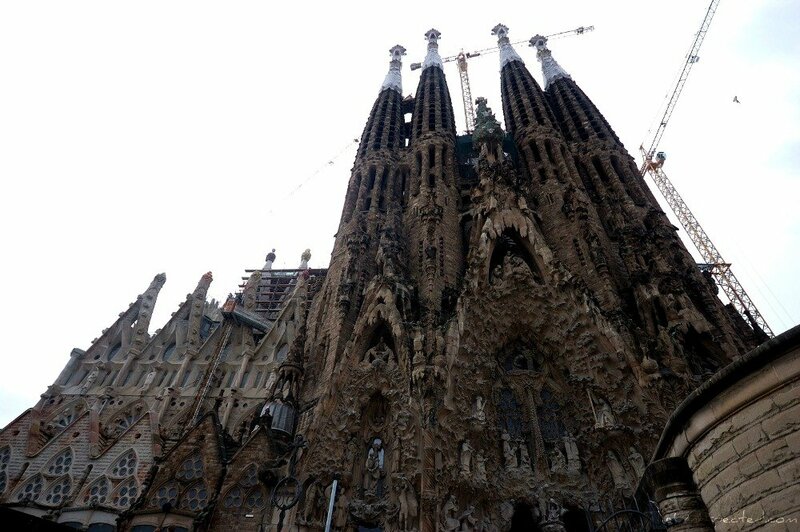 And I hope to visit soon La Sagrada Familia itself! I was in Barcelona two months ago for work, and luckily found time to explore a little of i Montaner’s and Gaudi’s works again. 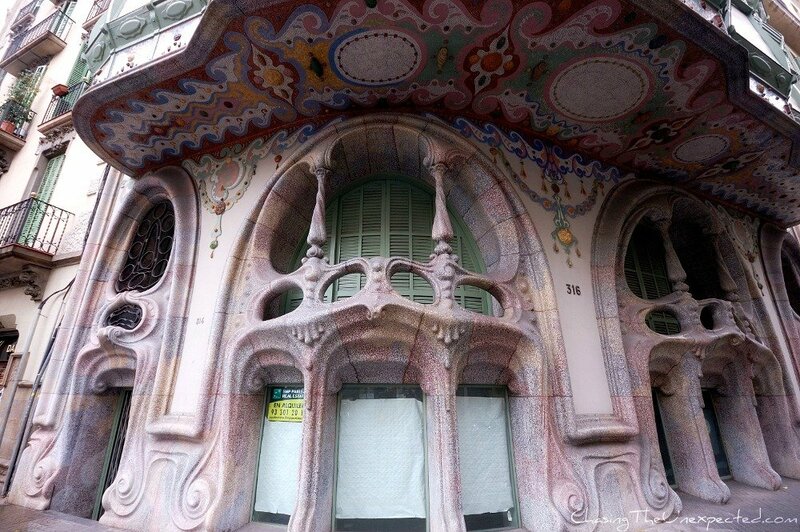 Didn’t see Casa Batllò, though – looks like I missed out on a fabulous building! Great photos, Angela. Gaudi’s work was definitely my favorite part of Barcelona. It seemed if I wanted to escape, his art work is a great way to do that, visually. True, it felt like I was on a playground! Wow, these are amazing photos! The architecture seems right out of one of Tim Burton’s movies. Love la Casa Comalat. Thanks Jennifer, Gaudi’s architecture is surreal indeed! Great post! I’m going to Barcelona this weekend, I’m sure to see these amazing designs!